Note: These 33 leaves are bound into the volume after the leaves carrying Blake's original notebook material. These manuscript pages are part of the bound volume known as “The Rossetti Manuscript” of “The Notebook of William Blake”. 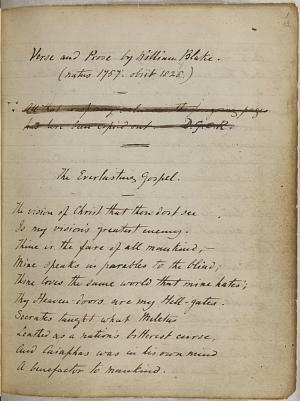 The notebook was bound by DGR after he made the transcription of Blake's poems that is represented by these pages, which are gathered into the volume after the original Blake notebook pages. Although Blake's notebook has been edited, with a facsimile of the original pages, by David V. Erdman, that edition does not reproduce DGR's transcription, which appears here for the first time. As DGR's note heading this transcript indicates, the text represents DGR's judgment of “All that is of any worth” in the notebook. The transcription contains a large selection from Blake's manuscript texts. In copying Blake's works, DGR did not scruple to edit the original materials, which he saw as rough and in need of such intervention.